If you fish, there are “Pools of Fire” at Cannon’s Inferno in Twilight Highland that have a pretty quick respawn, and can be fished without aggroing nearby mobs (at L85, at least). I was able to get 60 or 80 over a short period of time while finishing up quests there. Good thought on the Embersilk cloth, was wondering where to farm it. Tailoring takes so much. Neat tip, if you’re going to farm your own Embersilk cloth, take the time to use a Potion of Treasure Finding. It’ll up the drop rates on Embersilk cloth and give you a little extra volatiles. I have been farming the marines for cloth lately, and it has been great. Not only do they respawn constantly, but the friendly ones will tank them for you(saving you on downtime), you are a short flight from the Org portal for training as you pass milestone points or to empty your bags at exalted prices, to craft you just need to head above the beach to where there are no enemies, and if you capture the beach head you get bonus sp/ap. Just spent about 2 hours here to farm volatile fires. I am also a miner so I picked up a few nodes as I killed these guys. Honestly this is a great spot to farm for non miners. I found a ton of greens I was able to DE as well. The only downside to this spot is that the vendor trash greys are not worth much but oh well. 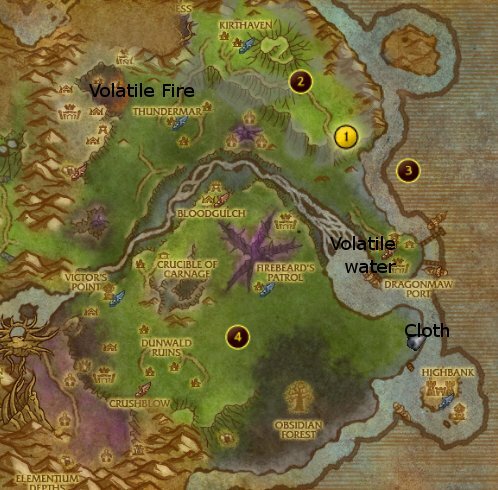 Thanks for the info on this spot, I didn’t even know fire elementals were up here. precious knowledge you have provided on this page. It’s certainly tremendously open-handed of people like you to convey unhampered exactly what many people might have distributed as an ebook to end up making some profit for themselves, certainly now that you could possibly have done it in the event you considered necessary. These smart ideas as well acted to become easy way to be aware that other individuals have the identical desire like my very own to figure out a great deal more pertaining to this condition. I believe there are a lot more fun occasions in the future for folks who see your site.